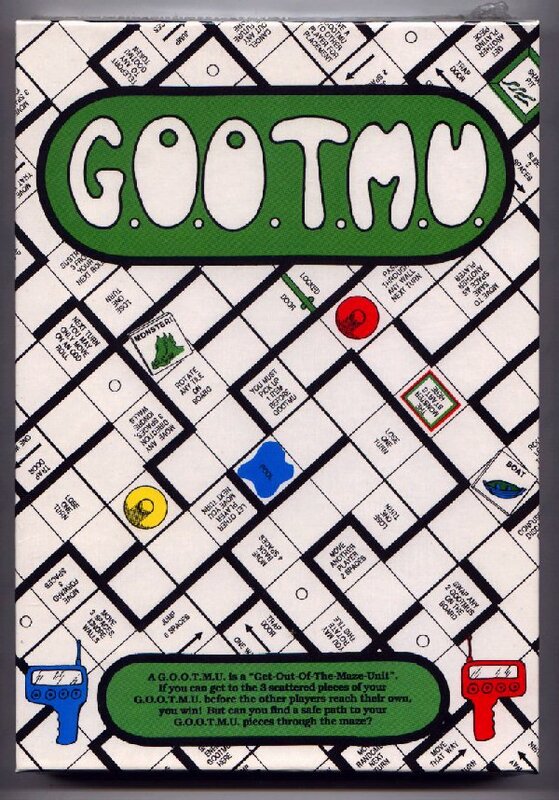 G.O.O.T.M.U is an abbreviation for "Get-Out-Of-The-Maze-Unit". To win the game you must find and retrieve the 3 pieces to your GOOTMU, while making it as difficult as possible for the other players to get theirs. GOOTMU is played on a number of tiles with 16 spaces each (shown in the picture is a board using 16 tiles of the many available), which assemble into a random playing board. The number of tiles used depends on the number of players in the game. The board is a wrap-around board; if you leave on one side, you re-enter on the opposite side. You get to decide where on the playing board your playing piece starts. Unfortunately, one of your opponents then decides where your 3 GOOTMUs are placed. Rest assured, your opponent will find the most difficult places on the board to put your GOOTMUs. Fortunately, you get to do the same thing to your opponent. Here are the French Rules for GOOTMU, provided by Jean-Marc Tribet.